A lot of the work that has taken place on sewlikearockstar.com has been with techy behind-the-scenes stuff and sometimes it may not look like much is going on. That's why we have created this "NEWS" page and you'll find info about all the new features and improvements that we've been sneaking in while you weren't looking! New goodies (with links when appropriate!) can be found here. Any known issues that members may be experiencing will also be posted here. Looking for the latest Newsletters and Promotional Emails? Click here! 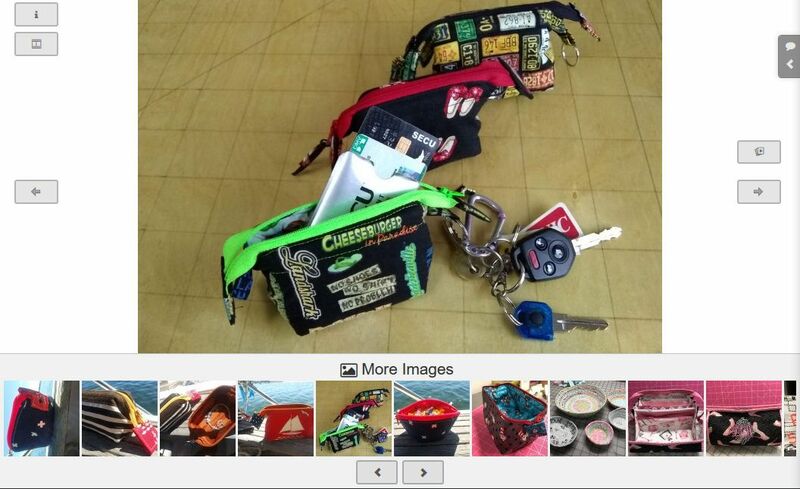 Did you miss what happened with Craftsy? Want to learn more about that? Click here! There has been so much going on since the last news post on Jan 30th and we've been sharing most of the exciting happenings through email and with the help of our Mighty Networks notification system. To catch up on all the news that hasn't been posted here, please see our Latest Newsletters Page! We've got some more website features coming to go along with the new Mastery Workshops that are nearing the end of production, we'll be writing about those here in the near future! Introducing the new Project Galleries and Photo Sharing Features! These exciting new features are finally here! 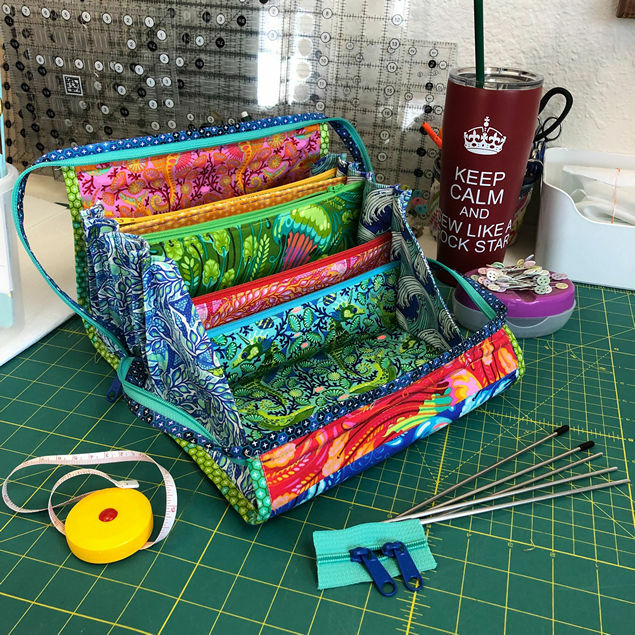 You can now share photos of your finished bags, post comments, browse through project galleries, and help inspire some new ideas among others in the sewing community here. 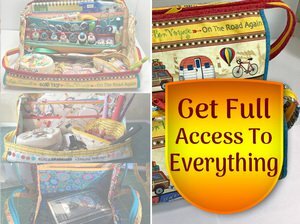 And not just photos of your finished bags either, you can also post pictures of your other projects, your sewing spaces, trips to retreats and lots more! Comments allow you to ask questions and have conversations with others in the new Image Viewer. Speaking of the new Image Viewer, did you know it can even play slideshows? If you are logged in then Check this out! There are so many new things to see and do, we even wrote a guide to help make sense of it all and get you on your way to uploading and sharing photos, posting and replying to comments and finding your way around. Have fun and don't be shy! We've also got lots more in store for the very near future! To all of our NEW MEMBERS.. you're coming in at a PERFECT TIME! I moved into studio space in November and discovered we had poor internet services - BUT - we have high speed cable getting installed on Jan 21-22 (at least that is what Comcast tells us!). SO LOOK FORWARD to our calendar being updated on about JANUARY 23rd or so.. after we make sure our tech services are functioning again. 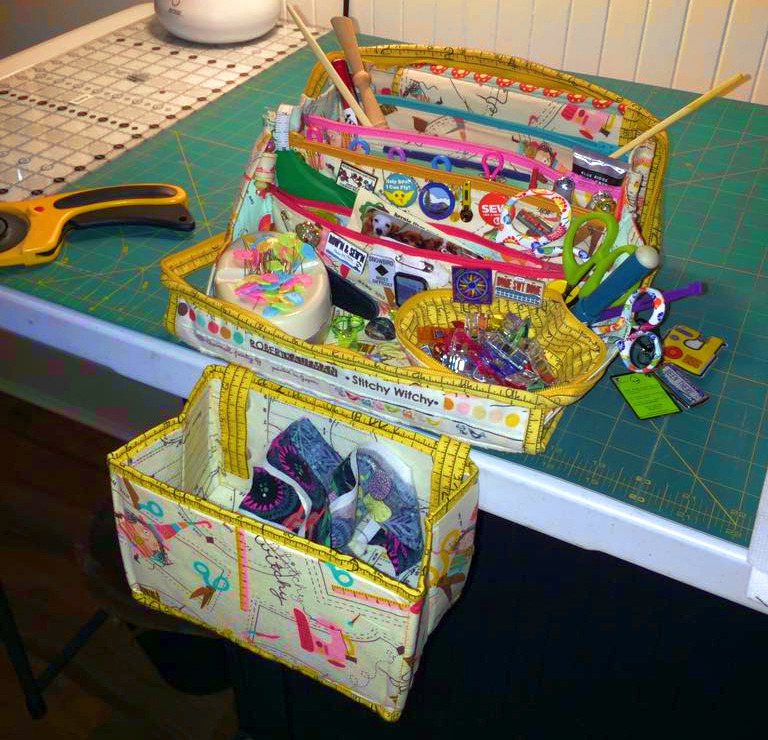 All of the Sally Sew-A-Longs, Mastery Workshops and Weekend Warrior Projects will be able to come back on line! Getting ready for a big new year! We have some incredible new website features that we're bringing everyone in the weeks to come! We're going to have project image galleries and uploads/sharing by members, community spaces where people can ask questions or talk about what they're working on, interactive social features and even a few other surprises. Not to mention... the new BONZA! We also want to give a big welcome to all of the new faces who have joined the Sew Like a Rock Star family this year. We are about to enter our biggest and most exciting year yet! 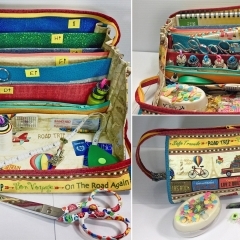 The Recorded Binding Intensive Sew-A-Long has been finished and is now online and available to watch! If you have access, you will see it in Member Area -> Your Items. Or you can click here to see it now! If you do not have access, it is on special at the time of this writing, for only $10. 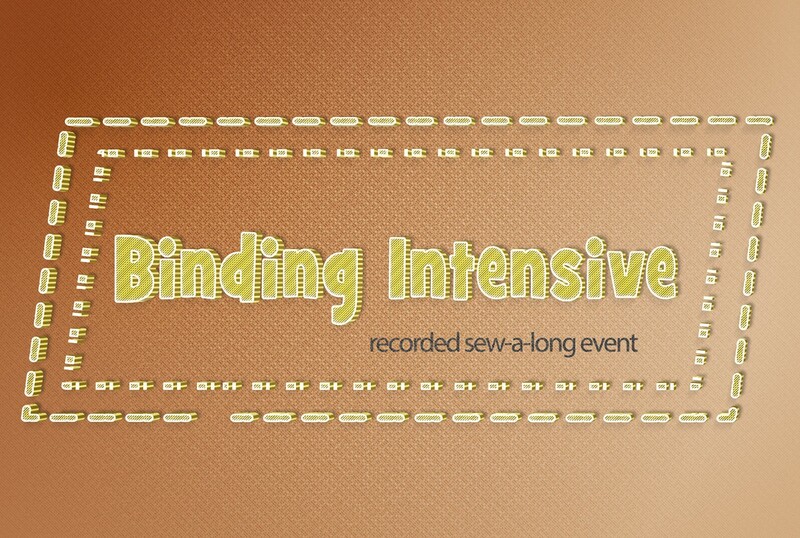 For more information on the Binding Intensive Sew-A-Long and to get access to it, you can click here. 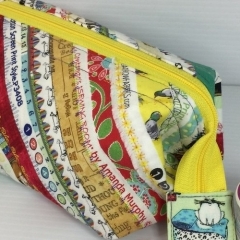 A special thank you to everyone who participated in this live Sew-A-Long. We had a lot of fun! The beginning of the saga, let's call it Chapter 1, is on also here on the news page, just below. Last week, we bought a cellular booster. On Sunday, it was delivered. We blew a good chunk of the day installing and tweaking it in hopes of getting it to work with my Sprint hotspot. I have an unlimited data plan - so if we could get the speeds up a notch or two, it could have been feasible to use that connection to support our cameras while we wait for a Cable connection install date. The booster was an epic fail. Our guy took four trips up on the roof to try different locations for the booster - and none worked well enough. This morning, Comcast gave me an estimated date to install the cable. (that’s the good news) The bad news is that the date they gave me is Jan 21-22. There is a neighboring business about 200-300 feet away that has the cable - and they gave me permission to use their wifi if I can get connected to it. I tried that this morning, but they are just too far away. By the time we buy any other booster type equipment, get it installed, tested... and even ***IF*** successful, we will be up against Christmas & New Year holidays, etc, and I am out for a business trip the whole first week of January. Ugh. So for now, it seems that we have to just cave and do other work between now and Jan 21. I can record workshop video here, slap them on a thumb drive, and upload them to our developer dude from my son’s house. 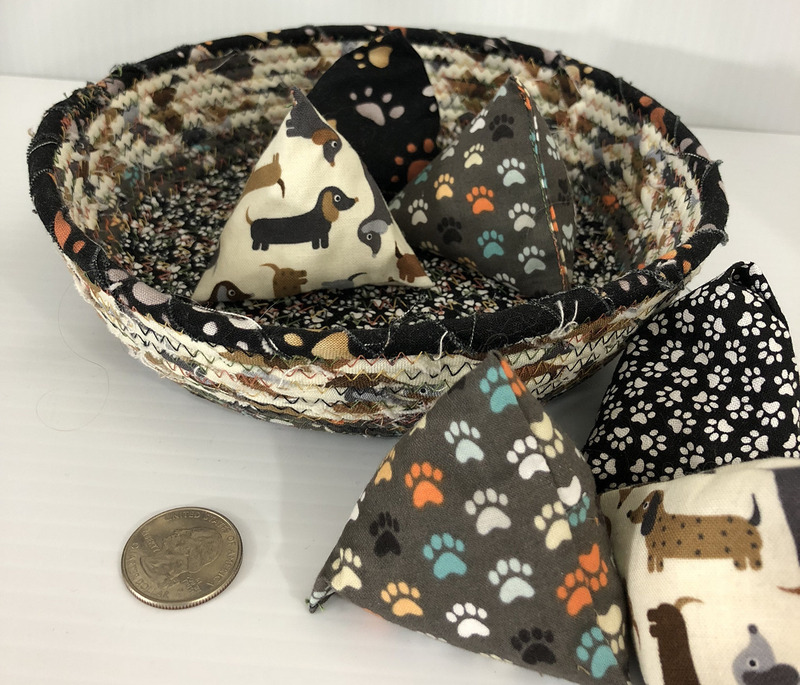 In the interim, we do have the new pattern coming out... so there will be lots of activity - just the Sew-A-Longs are affected by this internet service issue until Jan 22, it seems. So thank you to everyone that has been rolling with this. By tomorrow, we will be updating the calendar on the home page to reflect all of this. I can only apologize for this unforeseen situation. 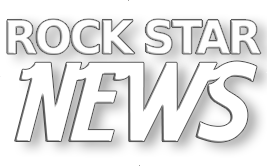 There have been so many new things happening that it's obvious we need to hire a full-time news reporter! Just kidding. But between all of the successful live events in October and November, the move, all of the new website features, new products (free and otherwise), there has been quite a bit to report on. We'll try and be a bit better about keeping the News page current so you're always up to date on everything that is happening. 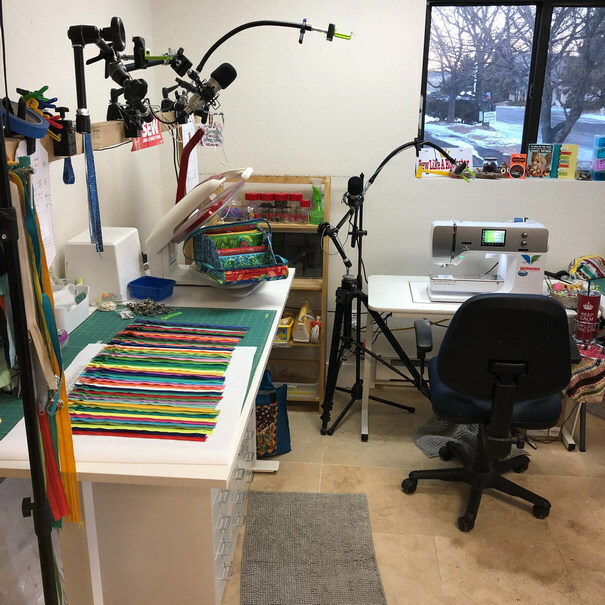 If you have been following along in our community on Facebook ( facebook.com/groups/sewmuchnicer ) , you probably already know the exciting news about me being able to re-acquire the studio space that I truly enjoyed in 2015-16. Moving back into the larger space has allowed us to create a fab classroom as well as the space better serves our extensive video schedule we have happening for the site. I love being back in a space that allows for more interaction with local friends, too! We've been working long hours... I'm so grateful to everyone that has been helping us get through this month! I came home sick from the Florida retreat on Nov 5th - been to the dentist and doc... and I'm still having issues. I couldn't do our normal live events and I sure couldn't accomplish everything we have done this month alone! So while I was sicker than a dog, all of this came about suddenly and has all been happening as quickly as possible. It's crazy! Nov 9th: I found out about the space being available - called my old landlord - he's a Sweetie! He had someone else interested in the space, but bumped them aside so I could come back. Yay! Nov 11th: Lease was signed, rent paid, yada yada yada. We're IN! Nov 12th: Ordered internet. Found out that Comcast (cable) internet could not be installed immediately - so I ordered CenturyLink (dsl) for immediate install so we could get back to work while waiting to hear back about cable install dates. Nov 14th: previous tenants vacated. I had learned that the landlord had given Comcast permission to have cable internet installed into the building to serve the previous tenant (they had massive computers in the space) 2 years ago. At the time of signing the lease, the landlord believed there was cable installed for them, which would be much better than the service I had in this space two years ago as well as what we have been struggling with over the past year. It was a bummer to discover that the last tenants cancelled the cable order and went with multiple dsl lines instead. Major bummer - but we gotta do the best we can to move forward, though. Nov 15: Move starts! Paint the place, get internet installed. Jim and my family pulled together to help me move (while I'm still really sick) so I could get the sewing video studio space put back together as quickly as possible. Nov 22: Turkey Day. I spent the day setting up our mounts and running power, camera. and mic cords. Getting ready for our first gig in the new place the next day! Nov 23: Show time. The team attempted to resume our scheduled Sally Sew-A-Longs. The day was an epic fail due to the internet service in this commercial building falling short in delivering adequate upload speeds to support the camera system feed. Each of our Sew A Longs involves 4 team members, 5 computers and I've got 16 pieces of equipment on my end that all need to play nice together. Each session is a major undertaking - so it was upsetting to see the poor internet service ruin the day - and our end product. We have been working to get the cable internet installed as soon as possible. It is ordered, but the cable lies 61 feet from the building and it seems that Comcast has to arrange a team of rocket scientists to get it to the building. It's very frustrating. We are in the midst of attempting a "band-aid" fix to increase our upload speeds in the interim (until Comcast is installed) More equipment has been ordered & if it arrives on time, and my guy can install it right away (antenna on the roof!!!) , we hope to know if this solution will work by December 3rd. Cross your fingers for us. We apologize for this unforeseen situation. We have had no choice but to reschedule events while the internet service fails us. Please watch this calendar for official updates. Thanks for your support! We look forward to having fun together very soon. This announcement comes a little late but it has been a very busy week! 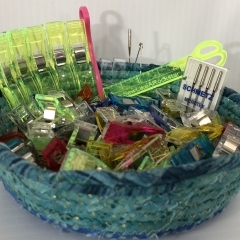 The Bionic Scrap Bin Accessory Workshop and the Bionic Needle Organizer Wallet Workshop are coming this month and next and we've just opened enrollment for them! Register now to save time and be one of the first to see the new workshops and lessons as soon as they are made available! You will also get full access to the Basics Collection right now, with your pre-enrollment -- if you don't already have full access to this great collection of essential videos. 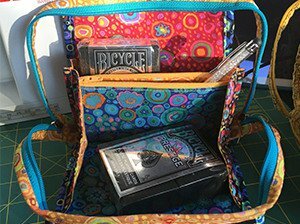 Downloadable PDF patterns are back! VIPs already had access to all of these in their Member Area. But now non-VIPs can purchase individual sewing patterns and add them to their Member Areas too! There is even a free one there. 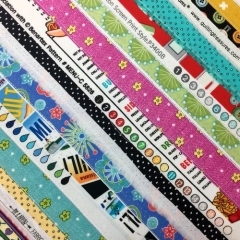 Check out our new Downloadable Patterns page! Two new videos have been added to the Basics Collection!. Welcome to the new people that have joined us in the Sewcial Space - part of the Virtual Retreat House! Sally got her cameras all fired up! 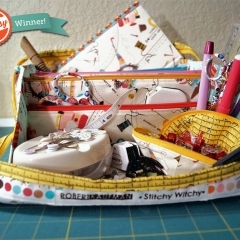 The bright detail of her sewing spaces is just amazing! We had a great testing day with lots of laughs! 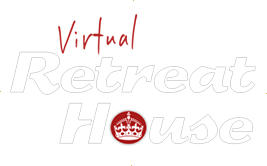 Check out the Virtual Retreat House slide in the slider in your Lesson Viewer. We are proud to announce the new Basics Collection! A collection of great videos and essential tips and tricks, almost 3.5 hours worth! 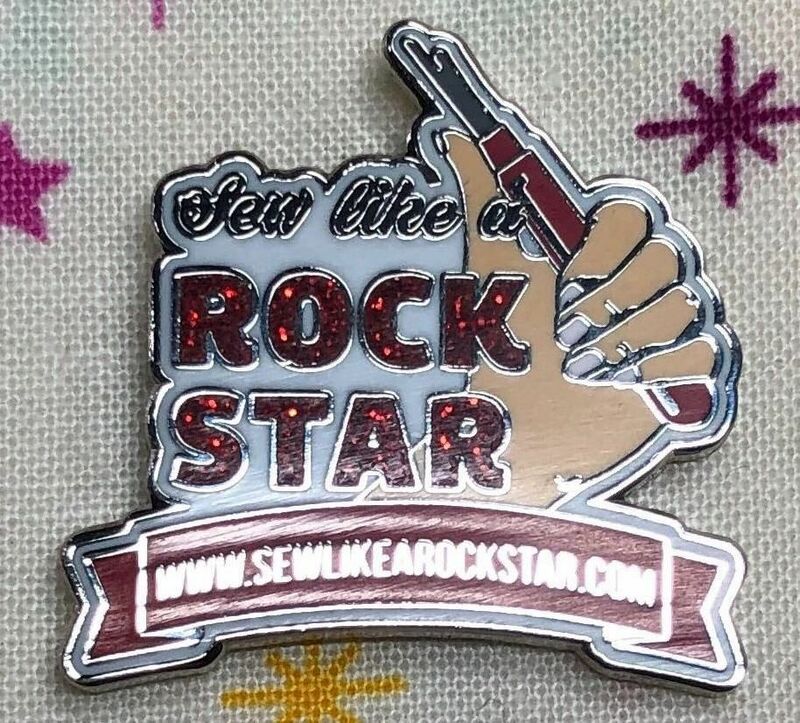 Free to anyone who has purchased something from Sew Like a Rock Star! We also have a brand-new video about Bobbin Collars, free to everyone! You can see it now from this link. We've also fixed up Sally's Favorites and have renamed it to "Faves and Unboxings". There's also a new babylock/brother feet unboxing video there, available to everyone. We've got a lot more in store.. stay tuned! We added some personality to the home page as well as smoothed out some navigation processes. Lots of new updates! We've just improved the top navigation in the Lesson Viewer and have also unveiled the new Virtual Retreat House. You can learn more about that here. All of the Basics videos are now accessible to everyone that has made a purchase on the site. One of our goals is to be THE best place to come for beginner tutorials. Pattern, Project & Membership sales support this site. ENJOY! We're working on the "Virtual Retreat House" this week! This will give everyone a chance to enjoy interactive opportunities! - Downloads - VIPs can now find all downloads in their Member Area, even the ones that used to be found only in the Lesson Viewer. We had a really great website launch and want to thank everyone for hanging in there with us! The development team has been working nonstop since launch day, making sure everything is running smoothly so we can begin adding all of the exciting new features we have planned! And we really do have some amazing community features coming soon. One quality-of-life improvement that just went live as of this writing..
We have some big website announcements coming soon, and more updates will be posted as ongoing work continues toward a most spectacular website and experience for all the sewists out there. Do check back again soon!